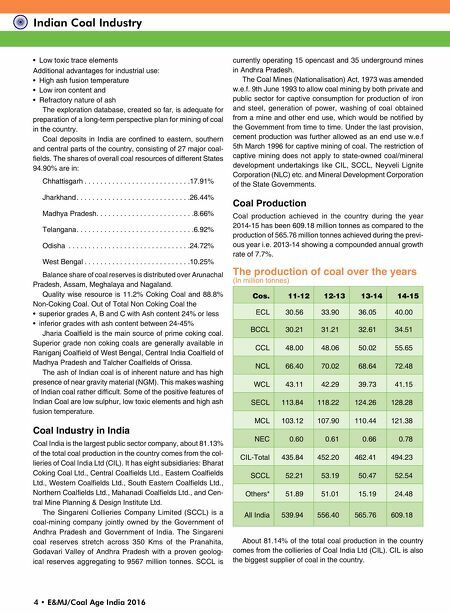 4 • E&MJ/Coal Age India 2016 Indian Coal Industry • Low toxic trace elements Additional advantages for industrial use: • High ash fusion temperature • Low iron content and • Refractory nature of ash The exploration database, created so far, is adequate for preparation of a long-term perspective plan for mining of coal in the country. Coal deposits in India are confined to eastern, southern and central parts of the country, consisting of 27 major coal- fields. The shares of overall coal resources of different States 94.90% are in: Chhattisgarh . . . . . . . . . . . . . . . . . . . . . . . . . . . 17.91% Jharkhand . . . . . . . . . . . . . . . . . . . . . . . . . . . . . 26.44% Madhya Pradesh. . . . . . . . . . . . . . . . . . . . . . . . .8.66% Telangana . . . . . . . . . . . . . . . . . . . . . . . . . . . . . . 6.92% Odisha . . . . . . . . . . . . . . . . . . . . . . . . . . . . . . . 24.72% West Bengal . . . . . . . . . . . . . . . . . . . . . . . . . . . 10.25% Balance share of coal reserves is distributed over Arunachal Pradesh, Assam, Meghalaya and Nagaland. Quality wise resource is 11.2% Coking Coal and 88.8% Non-Coking Coal. Out of Total Non Coking Coal the • superior grades A, B and C with Ash content 24% or less • inferior grades with ash content between 24-45% Jharia Coalfield is the main source of prime coking coal. Superior grade non coking coals are generally available in Raniganj Coalfield of West Bengal, Central India Coalfield of Madhya Pradesh and Talcher Coalfields of Orissa. The ash of Indian coal is of inherent nature and has high presence of near gravity material (NGM). This makes washing of Indian coal rather difficult. Some of the positive features of Indian Coal are low sulphur, low toxic elements and high ash fusion temperature. Coal Industry in India Coal India is the largest public sector company, about 81.13% of the total coal production in the country comes from the col- lieries of Coal India Ltd (CIL). It has eight subsidiaries: Bharat Coking Coal Ltd., Central Coalfields Ltd., Eastern Coalfields Ltd., Western Coalfields Ltd., South Eastern Coalfields Ltd., Northern Coalfields Ltd., Mahanadi Coalfields Ltd., and Cen- tral Mine Planning & Design Institute Ltd. The Singareni Collieries Company Limited (SCCL) is a coal-mining company jointly owned by the Government of Andhra Pradesh and Government of India. The Singareni coal reserves stretch across 350 Kms of the Pranahita, Godavari Valley of Andhra Pradesh with a proven geolog- ical reserves aggregating to 9567 million tonnes. SCCL is currently operating 15 opencast and 35 underground mines in Andhra Pradesh. The Coal Mines (Nationalisation) Act, 1973 was amended w.e.f. 9th June 1993 to allow coal mining by both private and public sector for captive consumption for production of iron and steel, generation of power, washing of coal obtained from a mine and other end use, which would be notified by the Government from time to time. Under the last provision, cement production was further allowed as an end use w.e.f 5th March 1996 for captive mining of coal. The restriction of captive mining does not apply to state-owned coal/mineral development undertakings like CIL, SCCL, Neyveli Lignite Corporation (NLC) etc. and Mineral Development Corporation of the State Governments. Coal Production Coal production achieved in the country during the year 2014-15 has been 609.18 million tonnes as compared to the production of 565.76 million tonnes achieved during the previ- ous year i.e. 2013-14 showing a compounded annual growth rate of 7.7%. 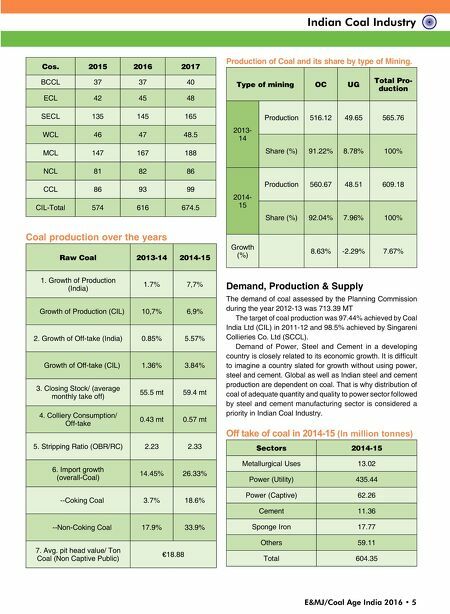 The production of coal over the years (In million tonnes) Cos. 11-12 12-13 13-14 14-15 ECL 30.56 33.90 36.05 40.00 BCCL 30.21 31.21 32.61 34.51 CCL 48.00 48.06 50.02 55.65 NCL 66.40 70.02 68.64 72.48 WCL 43.11 42.29 39.73 41.15 SECL 113.84 118.22 124.26 128.28 MCL 103.12 107.90 110.44 121.38 NEC 0.60 0.61 0.66 0.78 CIL-Total 435.84 452.20 462.41 494.23 SCCL 52.21 53.19 50.47 52.54 Others* 51.89 51.01 15.19 24.48 All India 539.94 556.40 565.76 609.18 About 81.14% of the total coal production in the country comes from the collieries of Coal India Ltd (CIL). CIL is also the biggest supplier of coal in the country.